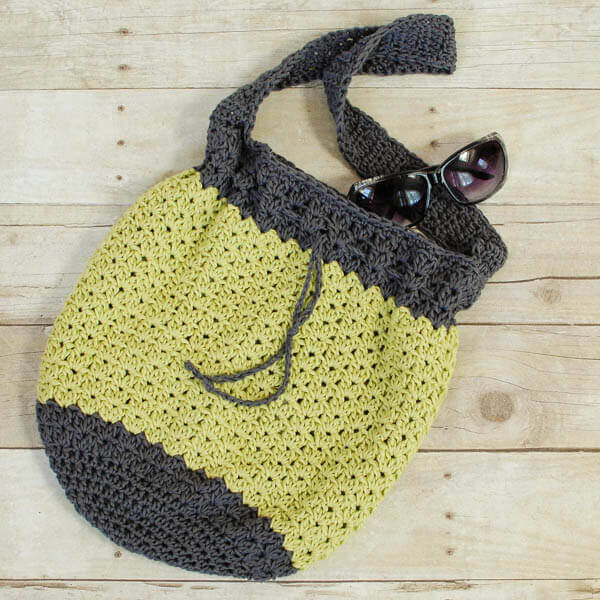 This crochet bag pattern is the perfect project for summer! It’s lightweight and portable for working on while traveling or just hanging on the porch. And best of all, it’s a free crochet pattern! And once your bag is all stitched up you are sure to love using it all season long! It creates a casual and breathable tote … perfect for a stroll around town, a trip to the farmers market, or a day at the beach! 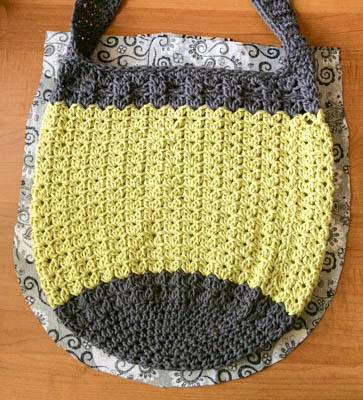 The free pattern is worked in two colors of cotton yarn to make it lightweight yet durable and features a drawstring closure to keep items safe. 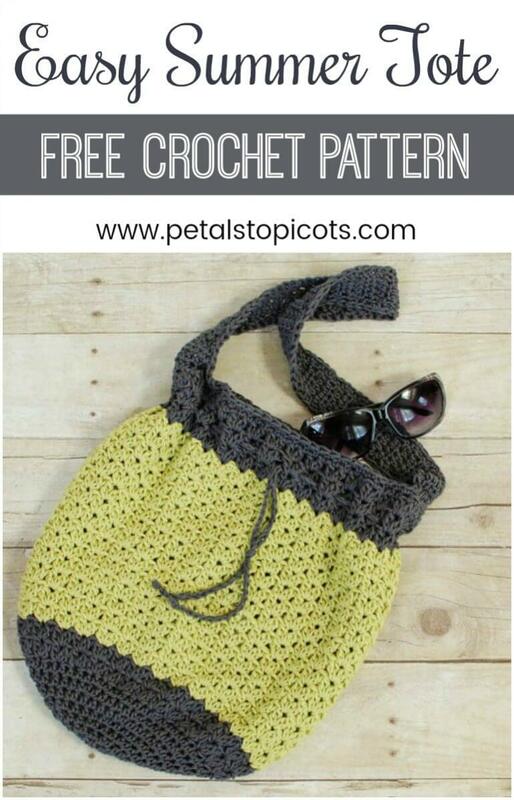 You can even stretch this crochet bag into the other seasons as well! I’m thinking it would be great worked up in a feltable wool like I did for this felted tote here. Finished tote measures approximately 13 in. wide × 13 in. tall, with a 14 in. strap drop. 2 Double Crochet Cluster (2dc-cl) — yarn over, instead hook into st, yarn over and pull loop through st (3 loops on hook), yarn over and pull through 2 loops on hook (2 loops remain), yarn over and insert hook into same st, yarn over and pull loop through st (4 loops on hook), yarn over and pull through 2 loops on hook (3 loops remain), yarn over pull through remaining loops. Double crochet Cluster V Stitch (dc-cl V st) — [2dc-cl, ch 1, 2dc-cl] in indicated stitch. With CA, ch 3 (counts as ch 1 + 1st hdc). Round 1: Work 7 hdc in 3rd ch from hook, join — 8 hdc. Round 2: Ch 2 (counts as hdc here and throughout), work 1 hdc in same st as join, work 2 hdc in remaining sts around, join — 16 hdc. Round 3: Ch 2, work 1 hdc in same st as join, 1 hdc in next, *2 hdc in next, 1 hdc in next, rep from * around, join — 24 hdc. Round 4: Ch 2, work 1 hdc in same st as join, 1 hdc in each of the next 2 sts, *2 hdc in next, 1 hdc in each of the next 2 sts, rep from * around, join — 32 hdc. Round 5: Ch 2, work 1 hdc in same st as join, 1 hdc in each of the next 3 sts, *2 hdc in next, 1 hdc in each of the next 3 sts, rep from * around, join — 40 hdc. Round 6: Ch 2, work 1 hdc in same st as join, 1 hdc in each of the next 4 sts, *2 hdc in next, 1 hdc in each of the next 4 sts, rep from * around, join — 48 hdc. Round 7: Ch 2, work 1 hdc in same st as join, 1 hdc in each of the next 5 sts, *2 hdc in next, 1 hdc in each of the next 5 sts, rep from * around, join — 56 hdc. Round 8: Ch 2, work 1 hdc in same st as join, 1 hdc in each of the next 6 sts, *2 hdc in next, 1 hdc in each of the next 6 sts, rep from * around, join — 64 hdc. Round 9: Ch 2, work [1 dc, ch 1, 2dc-cl] in same st as join, skip next st, *[2dc-cl, ch 1, 2dc-cl], skip next st, repeat from * around, ch 1 and join with a Sl st in first ch-1 sp — 32 dc-cl V sts. Round 10: Ch 2, work [1 dc, ch 1, 2dc-cl] in same ch-sp as join, work [2dc-cl, ch 1, 2dc-cl] in next ch-sp and each ch-sp around, ch 1 and join with a Sl st in first ch-1 sp — 32 dc-cl V sts. Rounds 11 through 24: Join CB and rep Round 10. Rounds 25 through 27: Join CA and rep Round 10. Round 28: Ch 1 (does not count as st), work 1 sc in same st as join and in each st around, join — 64 sts. Row 1: Ch 2, work 1 hdc in next 7 sts, turn — 8 sts. Row 2: Ch 2, hdc2tog, work 1 hdc in next 3 sts, hdc2tog, turn — 6 sts. Row 3: Ch 2, work 1 hdc in next 5 sts, turn — 6 sts. Rows 4 through 55: Repeat Row 3; add additional rows if longer strap is desired. Row 56: Ch 2, 2 hdc in next, work 1 hdc in next 3 sts, 2 hdc in last — 8 sts. Fasten off, leaving a tail to sew strap to other side of bag. Sew strap to opposite side of bag. Join CA in any stitch of Round 28 of bag, work 1 sc in each st across and up around edge of strap, join. Repeat on opposite side of bag and strap. If you would like to add a drawstring, ch approximately 90 sts and fasten off. Weave drawstring through stitches of Round 27 of bag; tie together and knot ends for detail. 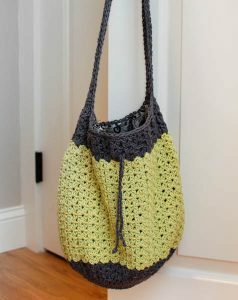 If desired, you can also line your crochet bag to keep little odds and ends from popping through. To do this, cut two pieces of fabric slightly larger than the dimensions of your bag; try to leave about a ½ in. in-seam around. With right sides together, sew around sides and bottom of bag. Fold top over and stitch top seam. Leaving fabric with right sides in, insert lining in your bag and hand stitch to inside-top of bag. Help! Doing the strap now and I get holes on each row at alternating sides because of the space between the initial chain2 and the hdc following it. Any tips on how to prevent this? Hi Grace 🙂 You can try this trick and see if it helps … instead of chaining 2, chain 1 and then work your first hdc right in that first stitch. Hope that helps! I finished the bag too. It turned out amazing. I love it. However, it has been sitting in my crochet basket for a year now waiting for me to put the lining in. Anyone have a tutorial on how to best line a bag? Hi Chelsea 🙂 Yes, 1 single crochet in every double crochet around. Thank You for sharing I finished this bad and even without the liner its a great bag! I did it in navy and lilac. I wonder if anyone has thought of making this bag in holiday colors: Green bottom, red body, green band around the top & green handles. Red white and blue for July 4th. Autumn colors. And Easter pastels for spring. How do you start this summer bag? I’m wondering if someone can help me with the lining. I looked up online how to sew lining into a bag that was crocheted, and refreshed my memory but then got confused. There was mention of depth? Does this pattern need to account for the depth of the bag? And also I bought fabric that I think might be too stretchy. I’ve cut it out using pins and sewing chalk, ironed it the whole nine; and when I went to pin it inside my bag it’s gapping. Do I need to take it all apart with a seam ripper and start over? Thank you much , for your reply, I am new at crocheting and patterns. I got it! This bag is gorgeous! What colors did you use? They are dreamy! I made one and almost a second one. Love this pattern, so easy. I used Vanna’s sequins in Merlot and Sterling. By Lion Brand. Such a great design and I really like the colors you chose! This is definitely something I will make for myself- thank you for sharing the pattern. Can this pattern be printed? What a great tip! Thank you for sharing the printfriendly website!